Christians have long observed that the Gospels do not record the actual resurrection of Jesus. The Evangelists record and describe Jesus’ death, burial, and resurrection appearances, but not the resurrection itself. Why? The most likely explanation is that none of the early Christians observed the resurrection event. If they were making up stories as some skeptics suggest, however, surely we would expect for them to have invented an elaborate and glorious story describing how Jesus rose from the dead. It is counter-intuitive to think they would fail to describe the cornerstone event of their religion if they were fabricating stories. The fact that they do not report and describe Jesus’ actual resurrection lends a lot of historical credibility to their story. While the Bible never records/describes the resurrection of Jesus, the Gospel of Matthew may provide us with a very good approximation of when the event occurred. Matthew began his account by depicting the women on the way to Jesus’ tomb early Sunday morning (Mt 28:1). In verse 2 he switches scenery to the tomb itself, describing what is happening at the tomb while the women are on their way: “Suddenly there was a severe earthquake, for an angel of the Lord descending from heaven came and rolled away the stone and sat on it.” Why did the angel open the tomb? 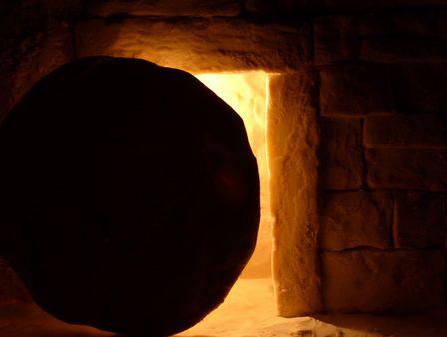 Could it have been to let the recently resurrected Jesus exit the tomb? If so, then Jesus was probably raised from the dead early Sunday morning, perhaps between 4:30 and 6:00 a.m. I realize this is only a possibility. Jesus could have risen from the dead hours before the angel opened the tomb. After all, Jesus did not need the angel to open the tomb to exit it. He had the ability to appear and disappear at will (Luke 24:31, 36; John 20:19, 26), and thus He could have simply passed through the wall of the tomb hours before the angel ever arrived. So why would the angel roll the stone away, if not to let Jesus out? Possibly the purpose was to allow the opportunity for Jesus’ disciples to investigate the tomb to see that it was empty. We may never know for certain when Jesus rose from the dead, but perhaps, just perhaps Matthew has provided us with an answer. I’ve given this scenario much thought as of late. Why did the angel roll the stone away. Traditionally you have the angel rolling the stone and Jesus walking out alive but that isn’t what happened, as you’ve pointed out. Most likely Jesus already arose before the Angel did anything. I think the event spurred two reactions 1) The soldiers fled and reported what had happened 2) the ladies were able to investigate the empty tomb and report what had happened. I find it odd that the Jews didn’t fight to re secure the tomb they just left it alone. Probably in order to try and incriminate the followers. As a toss back to our previous discussion is Sabbath in Matthew 28:1 plural? Yes, it is plural. Why? I don’t know. Regarding the plurality of “sabbath” in 28:1, my best guess is that this Sabbath is actually two Sabbaths, both of which begin at sundown on this particular Friday: the regular Sabbath which occurs at this time every week, and the High Sabbath of the first day of Unleavened Bread. Mark, You are dead on but Jesus wasn’t crucified on a Sabbath but before the Sabbath. If Friday was the high Sabbath then what day did Mary and Martha purchase their spices, one place says before the Sabbath then another place says after the Sabbath. There were two Sabbath’s in that week but that completely messes up the tradition view of what day Jesus was crucified on. I’m leaning toward Wednesday. That was the day in 30AD that the lamb was sacrificed for Passover. I didn’t mean to imply that Jesus was crucified on the sabbath. Jesus was crucified on “Good Friday.” Both the regular sabbath and the first day of Unleavened bread begin on the Saturday (which begins at Sundown of Friday). Mary and Mary then arrive on the first day of the week (Sunday) “after the Sabbaths.” Jesus died before the beginning of the Sabbath(s) (sundown Friday). Mark… I take it you were replying to me. If not you can disregard my comment. If Jesus died on a Friday then how can Mary and Martha prepare the spices before the Sabbath in and then after the Sabbath in Mark 16:1 (NIV) “When the Sabbath was over, Mary Magdalene, Mary the mother of James, and Salome bought spices so that they might go to anoint Jesus’ body.” and before the Sabbath in Luke 23:56 (NIV)”Then they went home and prepared spices and perfumes. But they rested on the Sabbath in obedience to the commandment.” This isn’t by any means a major deal just interesting how the traditional view is rarely challenged. However, it appears to be impossible for both sabbaths to be on the same day according to the above scripture references. It would take some study of the Hebrew calendar to sort this out. Is it possible that there were two back-to-back Sabbaths the year Jesus died: one on Friday (Passover), and one on Saturday (regular)? I don’t know. As I argued before, the Passover (and thus the Passover Sabbath) was on a fixed day of the month: Nissan 14. Every year it would fall on a different day of the week, just like our b-day does. Could it be possible that it fell on a Friday the year Jesus died, and thus would have been immediately followed by a regular Sabbath the next day? If this was correct, of course, you still couldn’t get a Wednesday crucifixion. It would be on Thursday. This would be an interesting study. As I’ve so often said I could be mistaken on some points and Nisan 14 is one of them. Was it Nisan 14 or 15 that begins the Passover. Also Passover was never considered to be a Sabbath but the day after Passover began the feast of Weeks, it was known as a high Sabbath. In 30 AD the high Sabbath was on Thursday if Passover was Nisan 14. In 33 AD Nisan 15 was on a Friday. According to the Astronomical data the two years could only be 30 AD or 33 AD, I’ve chosen 30 AD simply because a Friday crucifixion is pretty much impossible to reconcile with scripture as my research has turned out. I’ve been studying this very closely, even a hobby, partly because the season and partly because I have a thirst to know the truth. We may not every really know how the events unfolded exactly but there are markers in scripture to help us. Nisan 15 was the first day of Unleven Bread, or the passover sabbath. However, the 14th was counted as part of the Sabbath even though it was a day in advance of the actual observance time. Thanks… I thought the same but during research most point to Nisan 15 as the start of Passover. One thing bothers me about this, the Lord’s Super was it ate on the traditional Passover or sundown Nisan 14? Reason to nail this down is to justify when the spices were purchased. If I’m right Jesus was crucified on Wednesday Nisa 14 30 AD that would allow a day that wasn’t a high Sabbath or a weekly Sabbath that would allow the preparation of the spices. Hmm. I’m seeing it listed as Nisan 14/15 in some sources. Exodus 12 and Numbers 28 seems to say the day of Passover is a sabbath, while Lev 23 seems to say it is the day after Passover. Not sure. One source I found that may be helpful is http://doig.net/NTC18.htm, taken from a book on Biblical chronology. The author shows the evidence for/against different positions. He specifically addresses the idea of more than one Sabbath (Matthew’s plural), noting that this is common but does not imply more than one Sabbath day. He also discusses the buying of the spices. Somewhere I have all of this sorted out with someone who was arguing for a Wednesday crucifixion. Unfortunately, that was 12 years ago and I have no idea where it is. Suffice to say there are “three pilgrimage sabbaths” in addition to the regular sabbath: Pentecost (feast of weeks), Feast of Tabernacles, and the Feast of Unleavened Bread. The first day of the Feast of Unleavened bread (Nissan 15) is the day following Passover (Nissan 14). Jesus celebrated Passover the evening before He was crucified (Thursday) at/after sundown. Remember, Friday (and the Passover) begin at sundown Thursday, not at midnight. Friday morning (this is still the Passover) Jesus is crucified and He dies around 3:00 PM and is removed from the cross and taken to the tomb. So Jesus is crucified, dies, and is placed in the tomb on the Passover. 1. Was crucified, died, and placed on a tomb on the Passover. 2. We know that this particular Passover fell on a Friday. 3. We know that this was Friday because it was the day of preparation. 4. We know that the “following day,” the Sabbath, guards were put at the tomb. 5. We know that on the first day of the week, “Sunday,” which followed the Sabbath(s), Jesus arose from the dead. It is because it was also common during the time of Christ to lump Passover in with the Feast of unleavened bread since there was no break between them, Passover begging on the Nisan 14 and the Feast of unleavened bread beginning on Nisan 15. In other words, it was common to speak of 8 days including Passover instead of the Seven referring only to the feast of unleavened bread. The disciples were actually referring to the “Passover” here which you will note if you continue to read..
I’m sorry that I don’t seem to be making myself clear because I’ve been saying the same thing since my first response. I’m not sure where the confusion is coming from. I don’t think I read far enough to see where he spoke of what days were what in what year. I do remember going through this those many years ago and there were some problems involved with it, not the least of which was exactly what year was Jesus born. Now, I have also seen some try to calculate that based on the idea that Passover was on a Friday (and also based on the idea that Passover was Wednesday, and Thursday). But there were also difficulties in the calculation itself as I saw more than one (and I tried to find this archived, but alas, it wasn’t there anymore). The problem is no one had a computer program to do it and this is based on Jewish lunar years and there is some serious calculating that needs to be done to reckon years and days correctly. I suspect that someone has does this correctly, I just don’t know who it is, though it seems to stick in my mind that the best calculation is 33 a.d. for the crucifixion. The thing I am most interested in is not the year, but the Biblical narrative which shows, as I already pointed out, that Jesus was crucified on Passover (Friday) and placed in a tomb, and rose from the dead on Sunday, the first day of the week. And for anyone else reading, remember that in the Judaism of Jesus’ time the day started at sundown, not midnight. BTW Jason, I went to the link I gave you and I still did not read the entire thing carefully but I did not see the date of 30 a.d. for a crucifixion anywhere discussed as I scanned it. Am I misunderstading you or am I just not seeing what you are referring to? I think you meant to address CS, as he is the one who mentioned the AD 30 date. Thanks. What year are you using for your calculations? This matters because if you are using 33 AD then Friday was the 14th which was the preparation day or the day the lamb’s were slain for passover. If 30 AD then the 14th, as I’ve recently found was on Thursday. At present I’m holding to a Wednesday crucifixion, albeit very loosely. In light of new information it very well could have been Thursday. Still studying his last day events not only for this question but also to become more intimate with his last few days. The day before Passover was the day of preparation as well. The second day was a high Sabbath as Luke points out. 30AD Nisan 15 was Friday making it a high Sabbath. It seems likely that the guards would have been in place after Sun down after they placed him in the tomb and sealed it. Again that depends on the year. Possible for 33 AD but not possible for 30AD – as I understand it. And that I do agree on… 🙂 Although the scripture doesn’t record the resurrection because no one witnessed it. They only discovered the Angel and the empty tomb on Sunday morning. It still speaks of Jesus appearing to his disciples on the day he rose. To address post 14 I do want to say it does matter. As Jason pointed out the days roll according to what year it is. The biblical Narrative is the most critical component but the Year matters as well. If 33 AD then Nisan 14 would be Friday then when was the high Sabbath? The link Jason supplied offered a whole new perspective I failed to consider fully about the plural Sabbaths, Friday could have been one Sabbath and Saturday the weekly Sabbath. My year was off slightly and it was justified by thinking the spices had to have been purchased between two Sabbaths but that is not the case. http://doig.net/NTC18.htm This is the link Jason was speaking of and it was me who mentioned 30 AD. Here is a link from the same sight that gives a chart of the days and years that fit. Not sure what that means, Luke. One question that bothers me. After Jesus rose from the dead, why didn’t he spend some time in Jerusalem walking around with the disciples, for everyone to see? What is the rush to get to Galilee, some 70 miles away? And if he did, why didn’t the disciples record it in the Gospels? Good question Max. I addressed that question here: https://theosophical.wordpress.com/2007/05/01/why-didn%e2%80%99t-jesus-appear-to-unbelievers/. And BTW, Jesus did make appearances in Jerusalem, and he did appear to a few unbelievers (e.g. his brothers). I’ve been reading Harold Hoehner’s famous book, “Chronological Aspects of the Life of Christ.” Regarding the plural “sabbaths” in Mt 28:1, Hoehner notes that the plural form appears many times in the NT (1/3), and never indicates a back-to-back Sabbath. We even see in Mt 12:1-12 where the singular and plural forms are used interchangeably. He also points out that while no work was to be done on the day of Passover, it was never called or considered a Sabbath. In fact, Jn 19:31 calls the Sabbath a “high Sabbath,” probably because the Passover fell on the regular weekly Sabbath, making it a particularly holy day. It seems clear to me, then, that since Jesus died the day before the Sabbath, that He must have died on a Friday afternoon in AD 33. The passover was not on Friday. Yeshua died on Wed. Thur was the High Sabbath. Sat was the resurrection. These are assertions. What is your evidence? While I’ve heard respectable arguments for a Wednesday or Thursday crucifixion, I have never heard anyone argue that Thursday was the Sabbath or that Jesus rose on Saturday. Having a Sabbath on a Thursday is like saying Cinco de May is on May 10. No one knows precisely when Jesus rose from the dead. All we know is that the tomb was opened early Sunday morning and discovered to be empty. But if Jesus died on Friday as I think the Gospels make clear, then to be in the tomb for 3 days (some of which are clearly partial days) would require that He be raised Sunday morning. Technically, if Jesus rose from the dead on the 1st day of the Jewish week and the 1st day of the Jewish week corresponds to our present day sundown Sat. evening.to sundown Sunday evening…THEN..Jesus could have risen from the dead on our present day Sat. evening and before dawn on our present day Sunday morning. The important thing is our Savior did indeed rise from the dead. Why discuss how many angels can dance on the head of a pin when it is of no consequence to my salvation. Unless the discussion also entails the present day church’s tradition of Sunday Easter celebration for again, Jesus could have risen on our present day Sat. evening. Happy Passover 2013, I’m Christian but find the word “Easter” a little strange, sounds too pagan to me. Lots of confusion and questions regarding the death, burial and Resurrection of Jesus Christ IMO (ie. actual date month/day/year, what day of the week, just one sabbath or one high sabbath and saturday sabbath that week, how long in the tomb 3 days and 3 nights or rose on the 3rd day, when risen? what time between Saturday evening just after sunset and Sunday morning at dawn, since passover and “Easter are linked shouldn’t we celebrate them in conjunction? etc…). Every time I think I’ve got it figured out somebody throws me a curve ball. Nearest I can figure, He died Wednesday afternoon, was placed in tomb Wednesday evening as sun was setting, Thrusday was High sabbath, women buy spices Friday then rest for weekly sabbath, Saturday evening (during twilight) Mary M. makes first trip to tomb and sees stone rolled away. So looks to me like Jesus rose Saturday evening just after sunset. Now some more info came to my attention regarding what appears to be conflicting stories between the Gospels so I’m back to the drawing board. It appears that the tomb was empty Sunday morning at sunrise. I agree with Dennis that “the important thing is our Savior did indeed rise from the dead” but if G-d gave us the evidence in the Gospels to find out what happened shouldn’t we seek the true story not just for us Christians but to give answers to non-believers? G-d Bless, Paul. 3 days & 3 nights are 72 hours. That is a mathematical fact. Christ died on the Jewish day of Preparation for their annual Sabbath known as the passover. He stayed dead for exactly 72 hours. He died just after 3pm and was taken down and buried in the new tomb of a man named Joseph, a rich man of Arimathaea. He rose exactly 72 hours later from the dead. Not one second before or after. Christ has always made the scholars look like morons. He did it when he was 12 years old in the temple and all during his 3.5 years ministry.Their way of getting even is to now proclaim him to be a deceiver by claiming the he lied about the duration of his death. However he is the TRUTH and their 2 nights and 1 day proclamation is a lie from the pit of hell. Ishtar or Ashtoreth or easter is nothing but a Serpent orchestrated hoax. He is going after another bride. Jesus never rose from the dead nor has anyone else ever rose from the dead but if you feel you have to believe such nonsense, fill your boots.